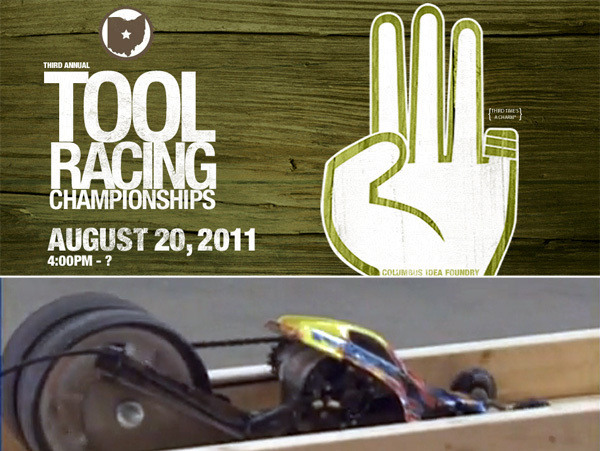 Once again, this year the tool racing fanatics are coming together in Columbus, Ohio, on August 20th to shake the heavens (in this case “heavens” consists almost entirely of a thrown-together 2×4 track located in a large warehouse) with the rumbling of cobbled-together power tool warriors. You can check out the website for more details/vids/etc. At toolraces.com. The carnage goes down at the columbus idea foundry in Columbus, Ohio. Honestly, how can anything that gets together a bunch of tool freaks sponsored in part by beer and vodka companies be a bad thing? Sure, someone might lose the odd digit or two, but that almost never happens. And after all the modifying of gear happens, there’s racing and crashes. There’s no downside here. If you’re in the Columbus area on Saturday the 20th — that’s tomorrow — swing by and check it out. Admission is free, but there is a $5 suggested donation, which is pretty cheap considering the tool-on-tool fun that goes down at one of these things. Does anyone have an address, or do we just drive around listening for whirring power tools and ambulance sirens? My Bad, check the toolraces.com site for the details. Forgot to paste that bit in. Nice catch sir. Now this is something that espn should cover! So when are you going to get all the power tool companies to come to Ohio and square off in the competition? Corporate involvement = lawyers = no more fun. I wish this had been posted a few days earlier, I live only a few miles from there but I didn’t know it was going on. Guess only checking in every few days just doesn’t cut it.